I can't believe the Modern Plus Sign Quilts Blog Hop is coming to a close! 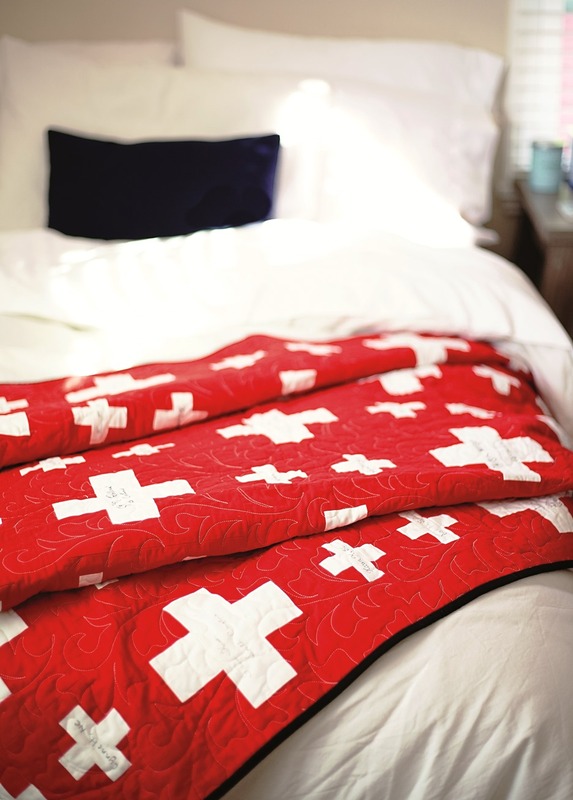 It's been such a fun two weeks sharing the quilts from the book. This stack of quilts represents almost 3 years of work between us. Well, there are few missing, but that's still a lot of quilts. There are so many of you to thank, I don't even know where to begin! 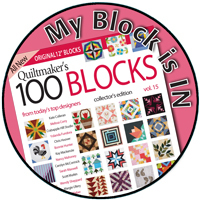 The blog hop would not be possible without you, the bloggers, that made all the beautiful versions of the quilts from the book. Thank you for spending your valuable time and resources to contribute to hop. Cheryl and I appreciate your efforts more than you know. You all are so talented, thank you! Here are all the quilts from the book in one mosaic (not in any particular order) and below is each quilt and a link to the bloggers who made a project. Each blogger was given the freedom to change it up in any way and they were so creative. 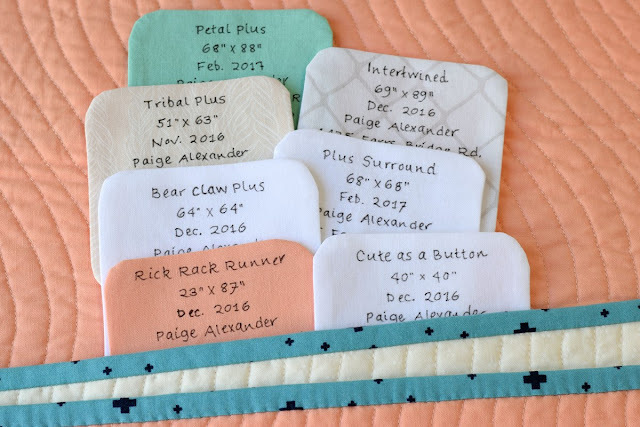 This picture is of the handwritten quilt labels for each quilt photographed on the back Rick Rack Runner Don't you just love the binding with the little plus signs. You can tell from the dates, many of the quilts were finished in December 2016. My tutorial for handwritten quilt labels is here. As many of you know, new authors are not given an advance on royalties so it was greatly appreciated to receive beautiful fabrics and supplies for all of the projects. It was such a joy to 'shop' for fabric and supplies and have it land on your doorstep. Due to constraints we were not able to provide a resource page to the various manufactures and supplies, so I want to acknowledge you here (and hope I'm not leaving anyone out). AccuQuilt Go! provided the Fabric Cutter (55100S) and Go! Orange Peel-4 1/2" die (55455). Aurifil provided Cotton 50wt for applique, piecing and quilting. Aurifil also sponsored the giveaways during the blog hop this week by providing the beautiful thread collections. These are the lovey colors used on Cute as a Button for the applique. C&T Publishing provided Carol Doak's Foundation Paper for paper piecing. Sulky of America provided Totally Stable iron-on tear-away stabilizer used in fusible machine applique. The Warm Company provided Warm & White batting for all projects in the book. BERNINA Sewing Center - We're in Stitches (Greenville, SC) Owner, Leslie White, generously supported us throughout the book-writing efforts. 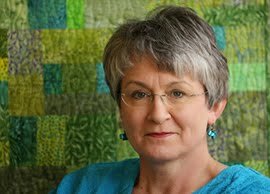 Johellen George, who beautifully quilted several quilts in the book. Darlene Sanford for pattern testing and reviewing. 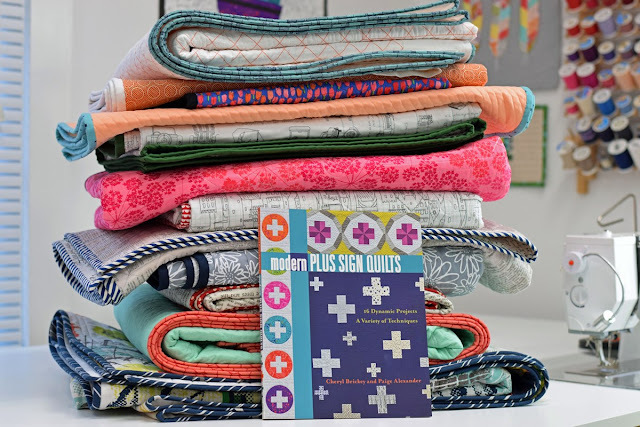 The 122 quilters across the US and UK (Kate, that's you) who contributed a Plus block for our signature quilt, Signature Plus. 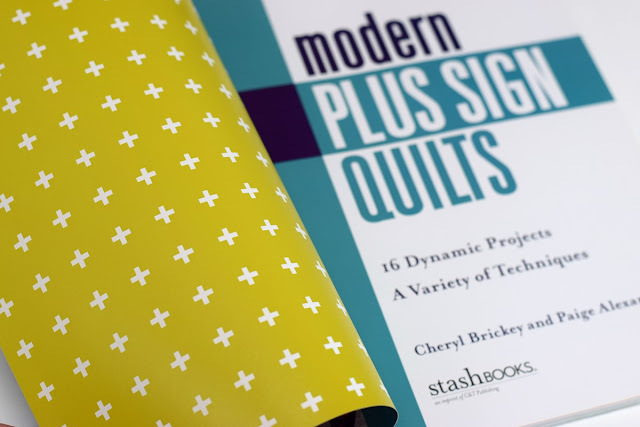 Many thanks to Stash Books for bringing our vision to print. They did such a beautiful job on the layout and photography, we are so pleased. 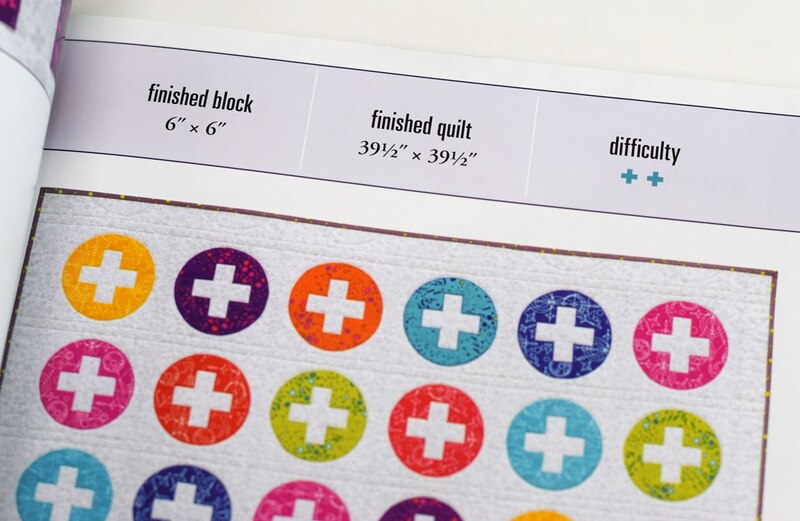 Look how they used little plus signs for the difficulty rating of each project. Aren't they cute? We assigned each quilt a ➕, ➕➕, or ➕➕➕ rating. And, they even put my favorite color in the inside front cover with more little plus signs. And last, but certainly not least, I would like to thank Cheryl (Meadow Mist Designs) for inviting me to join her on the incredible book-writing adventure. 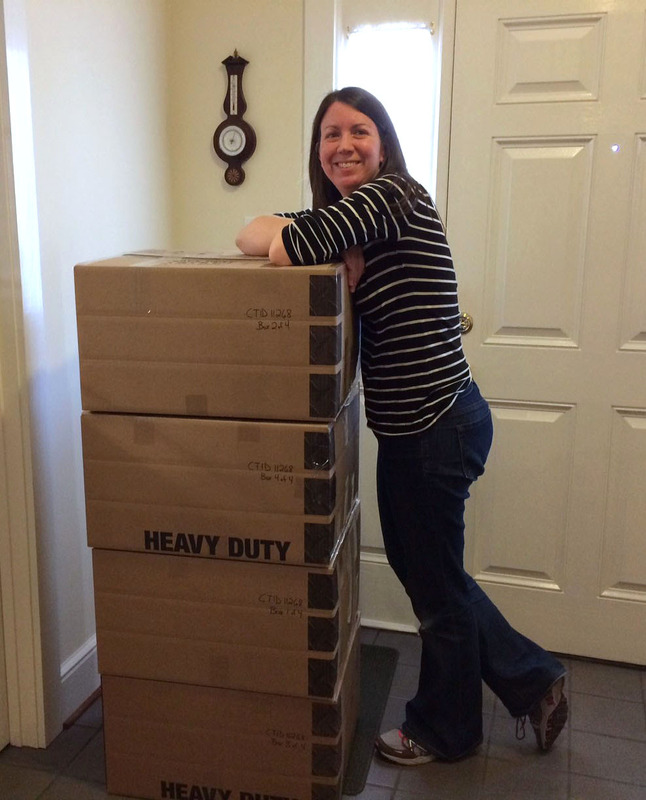 She's all smiles here because it's shipping day. We shipped off all the quilts to C&T for photography. This was taken on February 13, 2017. So once again, thank you everyone for a successful hop! For the giveaway today, Make Modern is generously offering a 6-month subscription to Make Modern Magazine. Giveaway runs from March 23rd through 8 pm EST March 30th and is open worldwide. Note: this giveaway is the same on both my and Cheryl's page and so there is no need to enter on both blogs. This has been the best book hop I've ever seen (and I'm not saying that because i was part of it). You guys deserve every success with this book and I think the variations on the patterns have been out of this world. WoW! All good things must come to an end I guess. Thank you and Cheryl for this hop. It was wonderful to see the same patterns done in different fabrics and color ways. It was all so creative and inspiring. Thank you!! Awesome post! The quilting world has so many amazing and wonderful Sponsors and generous too! I can’t wait to get my own book! My birthday and Mother’s Day is right around the corner, hehe. This has been a wonderful hop for a fantastic book Paige and it has been my pleasure to be a part of it. 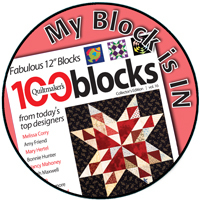 We are all part of this wonderful caring online quilting world wether we blog or read blogs we are in it together and help and support each other. 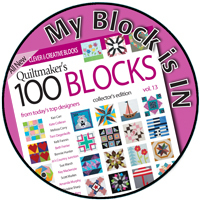 You are both very talented quilters and I wish you success and happiness as you enter the next phase of your quilting journey, you deserve it. I really enjoyed the hop and the bloggers involved did an amazing job! 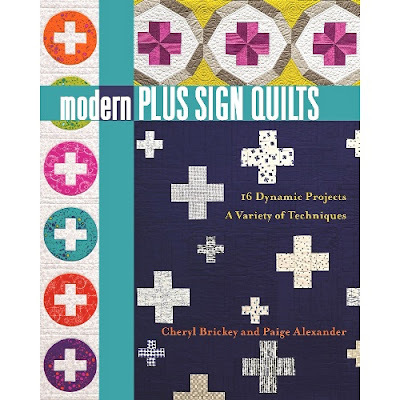 I saw such a fantastic collection of projects and I am definitely motivated to make several things from this book. This hop was a blast. There were so many days I said this is my favorite. Great job ladies. Check out your rafflectoper, the link for Make Modern takes you to Paige's page. This has been sew much fun! Thanks for your hard work. Now to pick a plus quilt and get started. It was a grand adventure. Thank YOU. It was a pleasure making a quilt from your book! Every single quilt inside those two covers is something to be very proud of! Thank you for inviting me to join in the Hop. 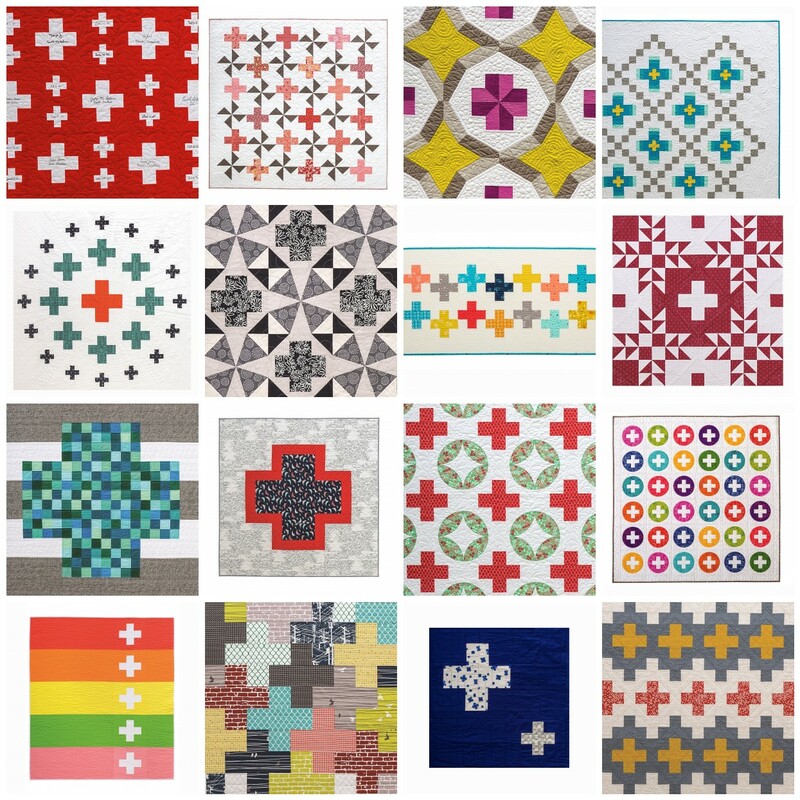 I had a blast and enjoyed seeing every single rendition of the quilts on all the blogs! This has been such a great hop! Congratulations to both you and Cheryl for a wonderful book. I was so happy to be part of the hop! Was an awesome hop! I loved all the quilt examples! Looking forward to getting a copy of the book! Thanks so much, everyone did an awesome job on their project! Congratulations and thanks all around to everyone who helped you and Cheryl bring your vision to life! Every single one of the quilts I've seen is so well thought out and beautifully made. Well done ladies . . . well done. Congrats and good luck with the book. This has been a fabulous hop simply because the book is so well done. 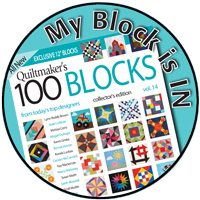 I look forward to making more quilts from the patterns and I was honored to participate. I had so much fun participating and this was such a great hop! I love the book and enjoyed seeing all the variations that different people made, and now I have so many ideas on what project I want to make next. Congratulations! 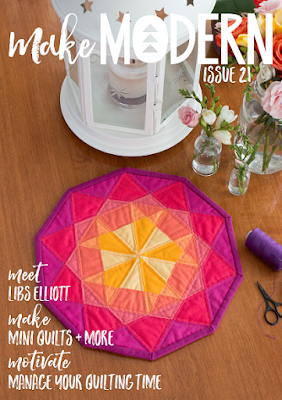 So many wonderful patterns and projects! Thank you for inviting me to participate in the hop. Your book is so well done, congratulations. There were a lot of gorgeous creations! I have really enjoyed watching this book hop - Everything I've seen from people making books seems like it is a far more difficult journey than we might think! Congratulations on such a nice result! This hop was so much fun from being involved in making one of the little plusses to being part of the blog hop. I am so excited for you and Cheryl and hope to see more works in print from the both of you. Congratulations again! What a successful hop! I'm so glad you & Cheryl got so much support in creating this fabulous book! Congratulations! What an informative post! Thanks for all the details. Your book is fabulous and seeing everyone's variations for the hop has been so fun. Thanks for linking up on TGIFF! This was such a fun hop - and I was thrilled to participate! 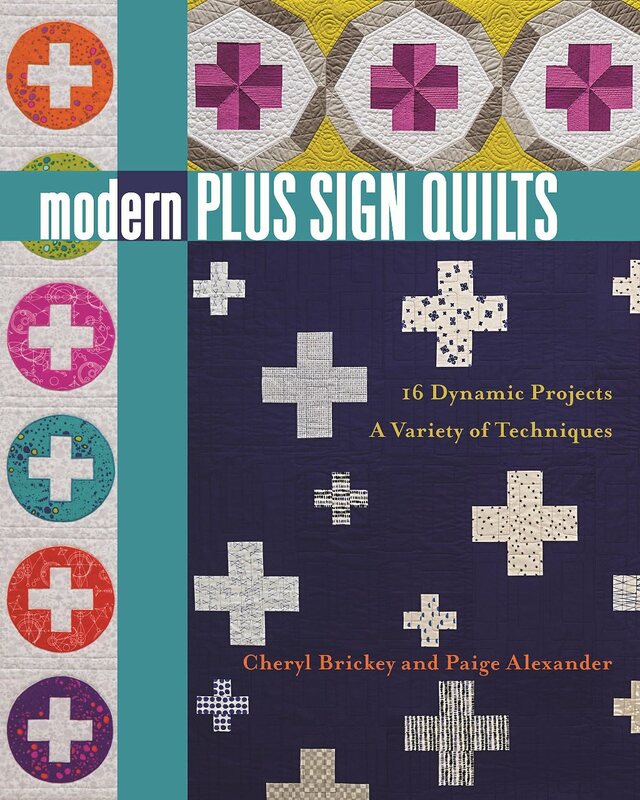 The book really is amazing and I look forward to making many more quilts from it. What a wonderfully gracious way to wrap up this super blog hop! Congratulations on such a fun venture, and may you and Cheryl enjoy much success with this book! The blog hop was so much fun. So many beautiful patterns and quilts. Thank you so much for hosting it. Danice, so glad you enjoyed the hop and we appreciate you visiting the blogs of the makers to see their awesome quilts! 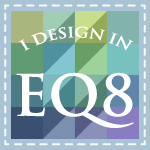 I enjoyed seeing all the interpretations of your designs during the blog hop. Some of the guest sewers were new to me too so it was really nice to get to see their blogs too. Best of luck with the book, thank you for the opportunity with the various drawings. It's been a busy two weeks. I'm still playing catch up with blog reading. Thanks for inviting me to participate. It's an amazing book!! I won the six month subscription to Modern Magazine, but I can't reply to your email. What a wonderful wonderful hop you two ran. This is really eye-opening seeing your labels with dates (love another label-loving-lady!) to get an idea of the length of time involved in getting a book from kernel of an idea to finished and on sale. I knew some of this with being involved in Lara's Crafted Appliqué book hop but it's all laid out well here. Excellent work, both of you!